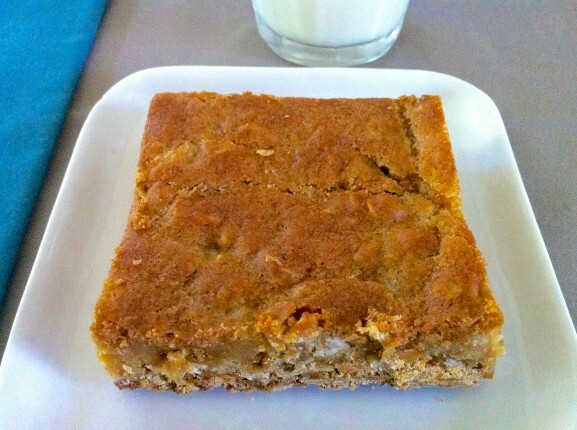 These Butterscotch Oatmeal Blondies are one of my husband’s favorite treats. So much so, I have actually wrapped a batch and given it to him as a Christmas or anniversary present over the years. He likes to freeze and eat them very cold. The rest of us like them room temperature. We think this might be his strategy to have more for himself!! Preheat oven to 375 degrees and grease a 9×13 baking pan. In a large bowl, combine the flour, baking powder, baking soda, and salt. Mix in the oats. In a separate large bowl, beat the butter, brown sugar, eggs, milk, and vanilla until creamy. In two batches, add the dry mixture to the wet mixture, beating until just combined. Stir in butterscotch chips and optional nuts. Spread the batter into the prepared baking dish and bake for 20-25 minutes or until just cooked through. I cover the pan loosely with a piece of foil after about 17 minutes of baking to prevent the top from browning too much. Cool completely for easier cutting and enjoy! I hope you like them as much as we do here, Margo! Thanks for the comment! Absolutely, Josie! I think that would be wonderful. This particular batch doesn’t have nuts–I make them both ways–so you can also simply omit. If you make them with coconut, please report back! That is a good questions, Sam. Butterscotch morsels (or chips) are basically a different flavor of chocolate chips, sold in the baking aisle alongside the latter. Let me know if this helps, and if you think you have them in the UK. I am now curious!